Kids moan about their boring lives all the time. We’ve all heard them do it. But there are kids out there who would give anything for boring – because they live with crazy. Harmon Burke was that kind of kid. In the novel Waiting for the Cool Kind of Crazy, author M.D. Moore spins the tale of Harmon and his brother’s lives with their paranoid schizophrenic mother – as both children and adults. Waiting for the Cool Kind of Crazy is a novel filled with the feel of truth. Author Moore is a therapist who has worked with patients and families struggling with mental illness and his characters ring with realism in a lot of places. As he recounts his fictional brothers’ upbringing in bits and pieces along with their fractured adulthoods, he makes the challenges of loving someone with a serious mental illness heartbreakingly clear. The basic story is Harmon’s. He lives in the town he grew up in and has managed to carve out an existence for himself with a small furniture restoration business. His modest dreams are dealt regular blows as he and his brother Connie deal with their mother who spends her time in and out of crisis and hospitals. When he discovers that he is ill and cannot afford the treatment, his world is rocked just a little further. Not until a woman he knew in high school re-enters his life does he seem to have a glimmer of hope for a future brighter than his past. In a number of ways – from the re-emergence of the high school sweetheart and bully, to the machinations of small town politicians and the fearsomeness of the stereotypical “biker gang”, Waiting for the Cool Kind of Crazy comes up short in terms of plot originality. At some point we begin to sigh at the regularity and predictability of the bad things that inevitably befall Harmon. But I can easily look past a plot that’s been tread before when the author puts so much heart and soul into his main characters. Harmon isn’t a simple, downtrodden victim. It’s clear that his rage is part of his problem and that his rage is directed at his ill mother. And that she deserves it…and doesn’t. The ability of Moore to express the complexity of living with and loving someone who isn’t rational or stable or a fit parent is the most striking feature of the novel and makes it a compelling and heartfelt read. Though Harmon is at the heart of the story, Connie fills the role of the sibling who is not filled with rage, rather loves unconditionally and with tenderness his ill parent. Not because he doesn’t recognize her failures, but because he has a fundamentally different disposition than Harmon. Their mother, CeCe, remains an enigma – the story is told in the first person by Harmon – just as I suspect many people with mental illness remain enigmas to even their closest loved ones. Through her son’s eyes we see her fail, we see her rally, we see her relapse. We see the effect of her behavior on her children, and we see some of the toll her illness takes on her. The other characters are peripheral and don’t really matter- the heart of the story is with this small family. Moore does a really good job of telling that story and filling out the characters so that we can see how complicated this life is for all of them. I’d like to see a little more in the area of plot originality (particularly in terms of “bad guys”) but really enjoyed Waiting for the Cool Kind of Crazy for its excellent portrayal of a family that wished more than anything that it could be boring. 3 ½ stars out of 5 and a solid recommendation. 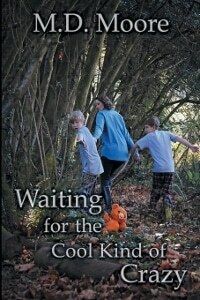 My thanks to MaryGlenn McCombs for send me a review copy of Waiting for the Cool Kind of Crazy.